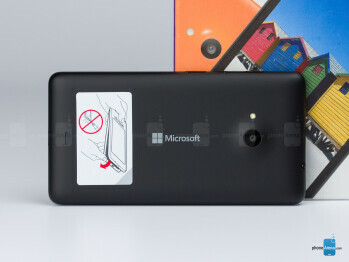 The first Microsoft-branded Lumia – the Lumia 535, announced a couple of months ago, is a low-end handset, targeted at the budget-oriented folk who still look for a device that offers the connectivity options of a modern smartphone, but having corners cut in all the right places, in order to make for a viable compromise. Costing $169.99 in the US, the Lumia 535 brings all the bells and whistles of Windows _phone_ 8.1 – Cortana included – powered by the humble Snapdragon 200, but still paired with a good 1 GB of RAM. So, does this handset really deliver usability, or is it just another entry-level device that frustrates users, rather than empower them? Let's check it out! 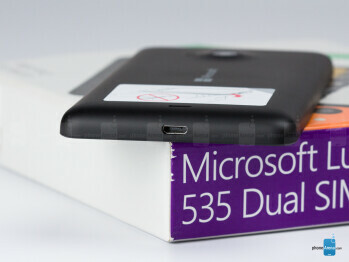 As we said, corners had to be cut, and this is evident once one lays their eyes on the Lumia 535 for the very first time – the handset looks rather dull – a black front with a quite darkened Microsoft logo above the display and a frontal cam nested right next to it – if you try to pick up the handset in a low-light environment, you'd be hard-pressed to tell which way is up. The back panel of the device wraps around its sides and can come in a few vivid colors, signature for the Lumias, though – our review unit is matte black, which just adds to the device's dry looks. Its plastic does not feel as cheap to the touch as one would expect, but does tend to attract a lot of fingerprint smudges. We also winced at the protruding camera – a gradual lump at the back of the 0.35" (8.8 mm) thick handset houses a 5 MP snapper, with its LED flash situated to the left of it. As far as buttons go – we found them to be pleasant to the touch – both the power button and volume rockers are placed on the right side, clicky when pressed, and just a very tiny bit shallower than we would like. 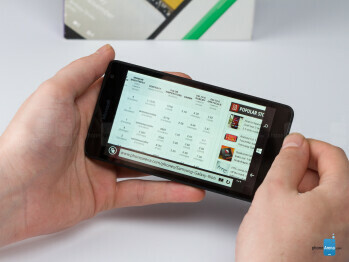 Size-wise – the handset sports a 5" display, but does not feel bulky to handle. In terms of contemporary handset size – the Lumia 535 falls in the "normal" category – it keeps the user mindful of which pocket they tuck it in, yet is not larger-than-comfortable. The entry-level 535 looks to deliver an industry-standard experience in terms of display size – its 5" screen delivers a more comfortable usage experience than the 4" one that adorned the Lumia 530. Its pixel density, however, is, as can be expected, on the low side – a 540 x 960 resolution makes for a 220 PPI ratio, which often means that the user will need to zoom in to read text on webpages. We were pleasantly surprised by its color temperature – measuring at 7069 K – just slightly higher than the reference value of 6,500 K – the display does not look too cold and its color reproduction is pleasant and rather accurate. The viewing angles are, as can be expected, pretty harsh – though, not as bad as we've seen on other low-range handsets. Watching the display straight on will provide for an even image, both in portrait and landscape mode, however, slightly tilting it will lead to distortions. As far as brightness goes – the lowest the display can go is 61 nits, which doesn't make for pleasant usage in the dark. The highest level it can go to is 433 nits, which, combined with a strongly reflective glass on the panel, doesn't make it easily readable under the sun as well. 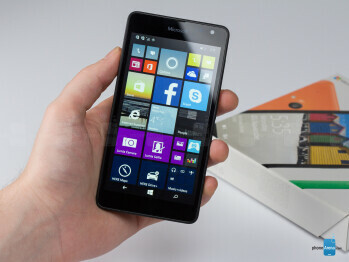 The Lumia 535 is loaded with Windows phone 8.1 out of the box – a unique-looking mobile system, which is not comprised of the typical home screens and icon setups, but rather has one "Start" menu, full off customizable tiles, which represent each launchable app. Some of them could be active – dubbed "Live Tiles", they show notifications from their respective app, keeping the user informed at a glance. The drop-down notifications menu holds 4 system tool toggles, which can be freely customized to be whatever the user desires. The 535 also comes loaded with Cortana – Microsoft's virtual assistant, which has made quite the buzz in the past, having proven itself to be just as capable, if not even more so, as the other competing assistants on the market. Cortana will remember your name and your interests and will often suggest activities and news, which she believes would be interesting to you. Microsoft touts having spent a lot of time making sure that Cortana sounds less fake and more lifelike while constructing her sentences, and we would definitely agree that she is the least robotic-sounding assistant out there at the moment. Windows phone 8.1 also includes an Office package, which runs smoothly on the Lumia 535. It will help users read and edit documents and spreadsheets on the fly, and while using a 5" screen for said tasks is not ideal, we appreciate the effort in designing the Office apps in a way that allows some workflow and functionality. In general, newcomers to the platform will be greeted by a learning curve, which appears to be much steeper than it actually is. 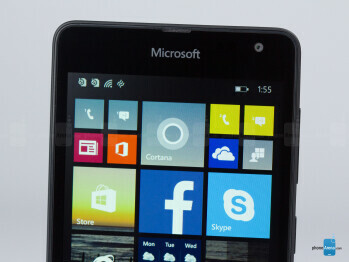 In a day or two, users will find Windows phone to be pretty functional with its design. We do have a major gripe with its settings menu, though, as it can be a puzzling mess. Most options are spread out in various sub menus, some of which make little sense. For example, if one wishes to set up their display-related settings – the screen timeout is set in the "Lock Screen" menu, the color accents and background image can be changed in the "Start + Theme" menu, there is a separate "Brightness" menu, which holds nothing but the brightness controls (low, medium, high), and if one scrolls all the way to the bottom - there is a "Display" menu, which has a couple of brightness-related settings. All menus are written in plain, white-on-black text, and looking for a specific setting could get fatiguing fast. A very modest 1.2 GHz Qualcomm Snapdragon 200 hums under the hood of the Lumia 535, though, it is coupled with 1 GB of RAM. In our experience, the performance of the Windows phone device is not accompanied by stutters or lags, though, launching an app is usually greeted by a brief hangup, even though it appears as if it is fully loaded and operational. During this period, touch input doesn't work, and the lack of any type of feedback can be frustrating and lead to a few accidental touches, as the user impatiently taps on the screen. 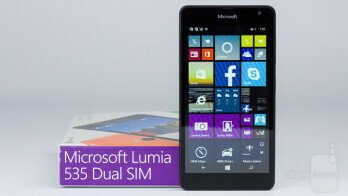 The Lumia 535 has 8 GB of internal storage, but around 3 of it is taken up by the operating system. Thankfully, it supports memory expansion of up to 128 GB via microSD, microSDHC, or microSDXC. As far as Internet browsing goes – the Explorer can sometimes have trouble drawing large or heavy webpages, and watching YouTube videos will crash it on random occasions. That aside, browsing lighter, or mobile-friendly pages is smooth and trouble-free. Gaming, of course, is only possible with lighter games, and the phone had definite trouble with the playback of our regular 1080p test videos – users who wish to watch pre-loaded clips, or even movies, on their handset will need to convert them to lesser formats first. The Lumia 535 is equipped with 5 megapixel snappers on both sides. The camera UI is fairly simple and offers quick access to manual controls (ISO, Exposure, Shutter time, Flash) via a top bar – the user needs to tap on the icon of the setting they wish to change, and a control wheel appears on the right side of the screen, just in reach for the thumb. We disliked the fact that we are not treated to a picture preview after a shot, and the icon that leads to the camera's gallery does not show a thumbnail of the last taken photo. Pictures end up being soft-looking with nicely pronounced, fairly accurate colors. They could end up being quite underexposed if there is a light source present in the frame, but with some work and positioning – outside shots can provide acceptable quality. Unfortunately, the image starts to grain up at the slightest hint of unfavorable lighting. The frontal camera obviously aims to please the selfie lovers out there and Windows phone even has a separate app for it, called Lumia Selfie – as if to drive the point home. Here, one can find various filters and "beautify" options, to help them create the perfect avatar of themselves. As far as video goes, the main camera is the only one allowed to record, and does so in 848 x 480 pixels at 30 FPS. As can be expected, the quality of the resulting clips is not great, with grain and artifacts visible even in well-lit conditions. The recorded audio is also average – with a noticeable lack in depth and a pronounced upper mid-range hump. The overall clip quality is passable for social media, not memorabilia. The Lumia 535 has a single speaker on its back, which may lack depth, but does not sound too tinny or quiet – in fact, it has a certain mid-range hump which provides some meat to the tone, allowing it to sound loud, without piercing our ears with excessive highs. The video player supports XviD, DivX, MOV and MP4, but does not play HD or higher formats – if the video starts at all, it will stutter and freeze, while its audio moves on ahead undisturbed. The Lumia 535's earpiece was pretty underwhelming – it delivered audio that was loud enough to hear, but was heavily digitized, with random noises and hiccups in the sound, forcing us to do some guesswork, figuring out what the other side was saying. Its microphone sounded somewhat the same – still loud and muffled, but at least – far less digitized, so the other side was treated to a clearer, more understandable audio. Equipped with a 1,905 mAh battery, the Lumia 535 may look like it can't stay on for long, but assuming that would be a mistake. Lacking a lot of pixels to keep alight, and carrying a 1.2 GHz Snapdragon SoC, results in a very sparing toll on the battery, allowing the device to easily run for a couple of days with normal usage. Windows phone also has a battery saving mode to help extend the juicer's life even longer. The official numbers say that the phone can endure 11 hours of talk time or 23 days of stand-by time on a single battery charge – both numbers are close to the average – not too low, nor impressively high. The Lumia 535 manages to deliver a good chunk of the Windows phone 8.1 experience, for a measly cost of $169.99. Yes, there has been a lot of corner-cutting involved, which results in unimpressive looks, low screen resolution and bad viewing angles, below-average camera, and sub-par call quality. On the flip side, however, we have a 5-inch display with comparatively accurate colors, a smoothly-running Windows phone system, the Office package, the full Cortana experience, and pretty good battery life. It is by no means a daily driver for experienced users, but we'd recommend it as an entry-level device for people who are OS-agnostic. It's also a good pickup for anyone who's interested in just trying out Windows Phone, but doesn't want to pull the trigger on one of the more expensive handsets. As for rivals and alternatives – Motorola's Moto G still offers a great value at $179.99, with a more powerful Snapdragon 400 SoC, a crisper 720p display, and the more familiar, more app-populated, Android platform. Now, whether having a choice of a great many apps actually matters in the world of low-range devices, we'll leave for you to decide.